or just head out for a relaxing day on the seas. From deep sea fishing to pier fishing to beach fishing, there are plenty of ways to catch that big fish that will turn your fish stories into reality. 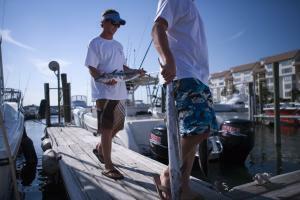 When people talk about Myrtle Beach fishing, they&apos;re usually referring to saltwater fishing. After all, we have immediate access to the Atlantic Ocean, along with numerous creeks and channels that feed into the ocean - all saltwater. For those accustomed to freshwater fishing, here are a few pointers: you generally use a different type of bait and tackle; the majority of in-shore fishing is done on the ocean floor, so you need a pyramid-shaped weight, or sinker, to keep your rig on the bottom; and, you should rinse your reel with fresh water after each use to purge the saltwater. If you don&apos;t have your own rod and reel, you can purchase or rent one at local bait and tackle shops, piers, or sporting goods stores. Myrtle Beach deep sea fishing is a true adventure, and catching those big, large fish in the deep water certainly offers a thrilling experience. In addition to the mighty Atlantic Ocean, the Myrtle Beach area is blessed with wonderful inland waters. These include the Intracoastal Waterway, which runs parallel to the coast from Little River to Socastee, where it merges with the Waccamaw River. Along the way, other rivers and tributaries feed into the waterway, and passage to the ocean is gained through Little River or Winyah Bay. 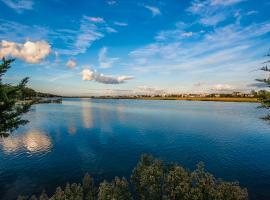 In its entirety, the Intracoastal Waterway runs from Boston to Key West. The waterway was "built" by the U.S. Army Corps of Engineers, taking advantage of existing rivers and other waterways and digging canals as needed to connect them. The completion in 1936 of the section between Little River and Socastee opened the way to commercial and leisure vessels for the entire length of the East Coast. Dignitaries from throughout the country attended a dedication ceremony here on April 11, 1936. 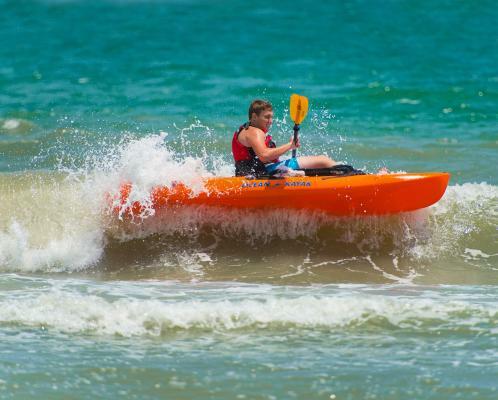 The Myrtle Beach Area&apos;s inland waters are popular for all kinds of recreation, including boating, fishing, and leisurely cruises.Outside of fishing in Myrtle Beach, you can make your trip more exciting with cruise boats. Cruise boats operate out of Little River, North Myrtle Beach, Myrtle Beach, Conway, Murrells Inlet, and Georgetown. Some transport passengers along the Intracoastal Waterway, while others explore the Waccamaw River or Winyah Bay. 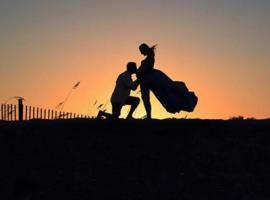 Some are sightseeing trips, and others offer dinner and dancing. Almost all provide enlightening narratives about the region&apos;s wildlife, scenic wonders, history, and legends. South Jetty at Murrells Inlet. North Litchfield, SC, Huntington Beach State Park. Telephone (843) 237-4440. On the Atlantic at Murrells Inlet. Parking. Fee. Open 6 am to 5 pm, daily. Enter through park, long walk to jetty. Apache Campground Fishing Pier. 9700 Kings Road, Myrtle Beach, SC, (843) 449-6486. On the Atlantic, 1,206 feet with mid pier shelter. Parking fee. Tackle shop, campground, restrooms, handicapped access, aquarium, store. Open April - October, 6 am to midnight; November - April, hours vary. 2nd Avenue Pier. 110 North Ocean Boulevard, Myrtle Beach, SC, (843) 626-8480. On the Atlantic, 905 feet, Parking fee. Handicapped access. Restaurant, restrooms, bait and tackle. Open Year Round, hours vary by season, daily. Cherry Grove Pier. 3500 North Ocean Boulevard, North Myrtle Beach, SC, (843) 249-1625. On the Atlantic, 985 feet. Parking Fee. Handicapped access. arcade, restaurant, restrooms, bait and tackle. Open March - November, 24 hours, daily. Myrtle Beach State Park Pier. 3301 South Kings Highway, Myrtle Beach, SC, (843) 238-5325. On the Atlantic, 750 feet. Parking fee (6 a.m. to 10 p.m. year round). Handicapped access. Gift shop, picnic area, camping, cabins, beach, nature trail, nature center, restrooms. Open 24 hours daily for campers and cabins. Pier 14. at 1306 North Ocean Blvd, Myrtle Beach, SC. Telephone 843 448-6500. On the Atlantic, Parking Fee. Handicapped access. Restaurant, gift shop, bait and tackle, pole rentals, restrooms. Open February - November, 7 a.m. - 11 p.m. The Pier at Garden City. 110 Waccamaw Drive, Garden City Beach, SC, (843) 651-9700. On the Atlantic, 660 feet. Parking fee. Handicapped access. Restaurant, arcade, restrooms, bait and tackle, entertainment in summer. Open December - February, 8 a.m. to 6 p.m., Sunday - Thursday: 8 a.m. to 9 p.m. Friday - Saturday: March - November 6 a.m. to midnight. Springmaid Pier. Springmaid Pier is currently closed due to damage from Hurricane Matthew. 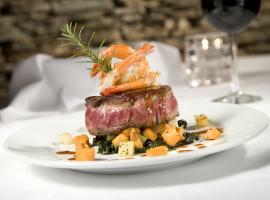 3200 South Ocean Boulevard, Myrtle Beach, SC, (843) 238-5189 ext. 3008. On the Atlantic, 1,060 feet. Parking. Fee. Handicapped access. Gift shop, restaurant, restrooms, bait and tackle. Open 7 a.m. to midnight. Surfside Pier. Surfside Pier is currently closed due to damage from Hurricane Matthew. The pier will reopen in 2018. 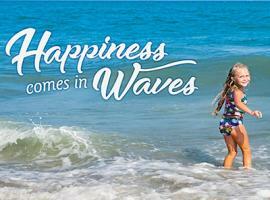 11 South Ocean Boulevard, Surfside Beach, SC, (843) 238-0121. On the Atlantic, 830 feet. Parking. Fee. Handicapped access. Gift shop, restaurant, bait and tackle, restrooms. Open March - November, 24 hours, daily; December - February 8 a.m. - 4 p.m.
Click here for Boat Rentals and Fishing Charters. A License is not needed when on a charter or fishing on a pier. However, each pier charges a fishing pass fee – approx. $8. If you would like to obtain a license to fish, a 14-day license may be purchased for $11. Fishing licenses can be purchased online at www.dnr.sc.gov/purchase.html and at the area locations below. Can I fish on the beach, and do I need a license? Yes, you may fish on the beach, but South Carolina requires a license to fish from the surf. 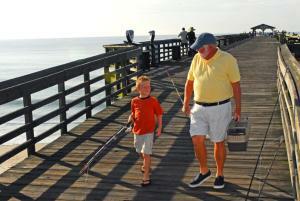 No license is needed to fish from a public fishing pier. 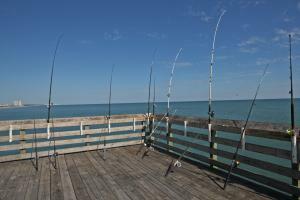 a nonresident may purchase a temporary recreational saltwater fishing license valid for fourteen specified consecutive days for eleven dollars, of which one dollar may be retained by the issuing agent. We do urge you to use caution when surf fishing, especially when swimmers or surfers are in the vicinity. Several piers are available for fishing, too. 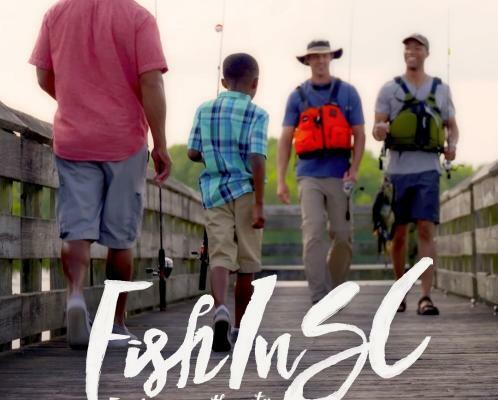 For more information about fishing regulations in South Carolina, visit the South Carolina Department of Natural Resources. What type of gear is needed for the different types of fishing? The piers rent rods and reels as well as sell bait and other supplies needed. Most charters also offer needed supplies. 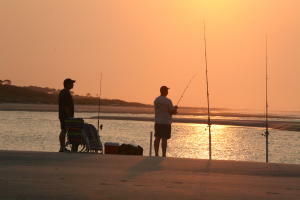 What kind of fish can I catch along the Grand Strand? 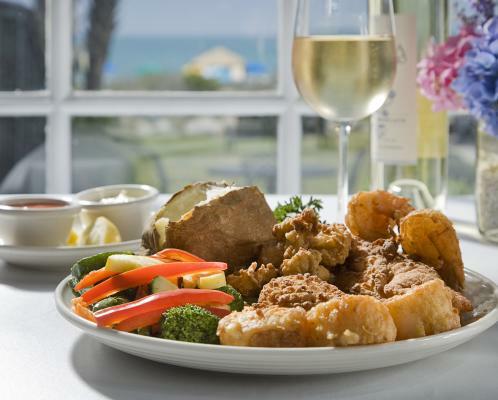 The most common fish caught in the waters off the coast of Myrtle Beach is black sea bass, snapper, grouper, larger sea bass, trigger, dolphin, wahoo, and king mackerel. 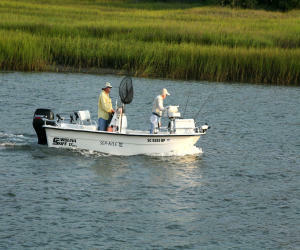 Learn more about Fishing in South Carolina.